I was going to write about this book last week (but then I got distracted), and I was having trouble thinking of something to say about it. To some extent, I'm still having trouble deciding what precisely to say here, and some of that is good and some is bad. 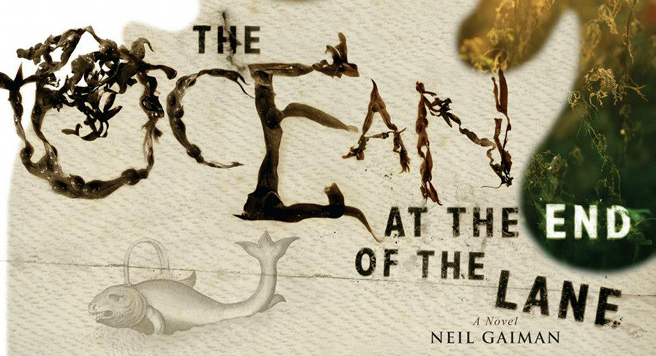 On the one hand, it's always a bit hard to talk about anything by Neil Gaiman. Not because it's so bad or because it's so good, but because it's so incredibly by Neil Gaiman. He has an incredibly distinct style of writing, and to a large extent I don't really feel like I have anything new to say about his style. It's interesting. He writes a sort of modern fairy tale that I really like and enjoy, although I do miss a bit of the sharp humor I find in some of his earlier works, that seems to be less prevalent now. Neil Gaiman is an incredibly talented writer. His stories always take turns you don't quite expect, feature new characters in new ways, and showcase the intense creativity lurking below all that curly hair. There is, for the record, quite a lot of curly hair. There is, however, an extent to which Neil Gaiman bores me. I know, you're not supposed to say that on the internet, but I did. I love his stories, I really do, but they all feel a bit the same after a while. Or at least his recent ones do. They all feel like a rainy November afternoon, which is nice, but a bit samey. And I should know. I live in Western Washington, where every day is a rainy November afternoon (except for the two weeks of sunshine in August and the four days of snow in December). It's, again, not that these are bad stories, or that they have an unpleasant tone. 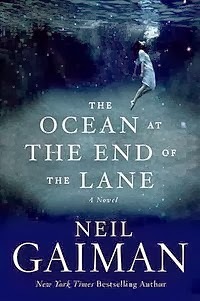 More that I feel as if Neil Gaiman is slowly stagnating, and I really wish we could shake him out of it, because he is a fantastic writer and there must be something new and exciting and terrifying hiding out in that aforementioned big brain. Now, on to The Ocean at the End of the Lane, and its particulars. The story, which we'll go over first and then discuss some particulars that worked and didn't work, a format I use literally every time but somehow still feel the need to explain, is deceptively simple on the surface. Our hero, whose name is never mentioned, and that makes me feel a lot better because I could not for the life of me remember it, is back in his childhood hometown for a funeral. On the way to the reception afterwards, he gets a bit lost and ends up at the farm where one of his childhood friends used to live. Feeling nostalgic, he stops in to say hello, and ends up sitting out back, staring at the duck pond, and reminiscing about the time when he was seven and he actually met Lettie Hempstock. Most of the story is then told in flashback. Our narrator is a lonely child whose family is going through a bit of a tough time financially, causing them to rent out their spare bedroom (or rather, the narrator's bedroom - he now has to bunk with his sister, ew). When one of the lodgers steals the family car only to commit suicide in it just down the road, our hero meets Lettie Hempstock, who lives at that farm. Lettie is eleven, probably, and just the kind of friend a lonely boy would want. She's funny and quick and likes gross stuff and is very matter of fact, and oh yeah, she's a little bit clairvoyant. Her mother and grandmother aren't all that normal either. But our hero is a little kid, and it all rolls off his back until he wakes up in the night gagging on a silver shilling. He shows it to Lettie the next day, as well as several other disturbing stories about people finding money, and she figures out what's going on. Someone in the spirit world is trying to give people money in order to gain a foothold in their world. 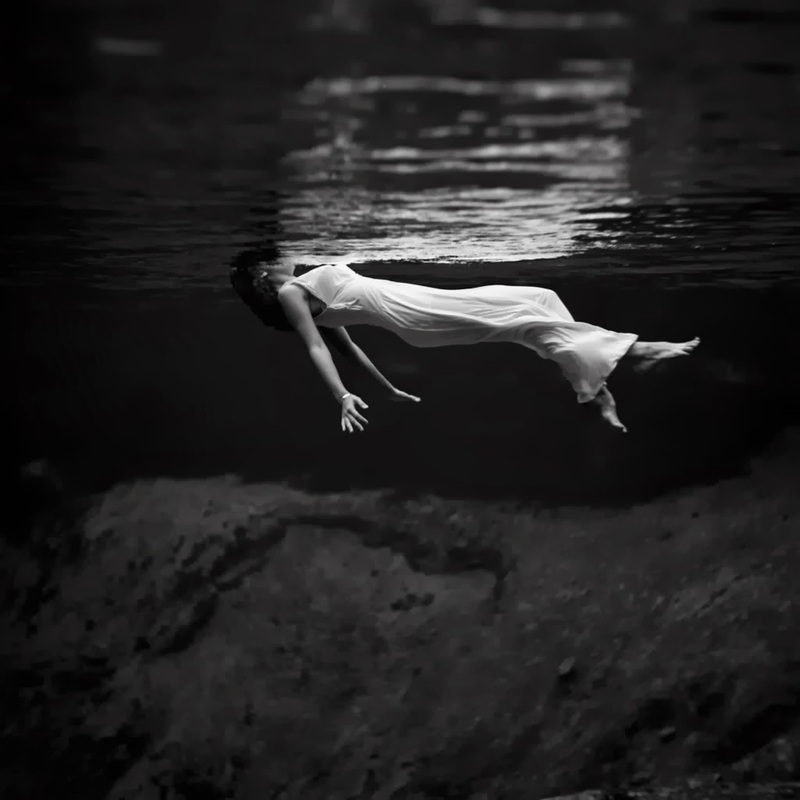 She's got to banish the spirit, flea, whatever, before it does more harm. And she allows, in a move that they will all later come to regret, our hero to come along. He's a little boy and he makes a mistake, and brings something back from the spirit world with them. A "flea" as she puts it, which burrows away as a worm in his foot. But that worm grows a lot bigger and more troublesome when he pulls it out, appearing again as Ursula Monkton, their new nanny. The boy knows that Ursula is the flea, knows that she's terrible and must be stopped, finds something infinitely sinister in her and her false nicety, the way everyone loves her, how pretty she is, but he can't do anything about it. Literally. Ursula won't let him leave the property. She's faster than he is, stronger, better liked, and, well, a grown up. Eventually, though, the boy is able to escape and get help from the Hempstocks - help that does solve the problem, but rather raises another one - because while Ursula is a problem that can be got rid of, she left something in the boy that can't. At least not without taking his heart with it. And I don't mean that she left something metaphorically in him. I mean that she bound a little bit of her foulness inside his literal heart as a backup plan. It's pretty oogy. From here it's all terror and tension, with a lot of weirdness to boot. Ursula shows her true form, there are these terrifying things called "The Cleaners", there's an ocean that fits in a bucket and contains all the knowledge of the universe, oh, and the boy's father might be having an affair. With Ursula. I'm not going to explain much more than that, so that you actually read this silly book, but that's the gist. It ends again with our hero sitting by the duck pond, shocked that he had forgotten so much, and being informed that of course he forgets. He always forgets. He's been back many times, and each time he remembers, then forgets. He looks at the ocean in the duck pond and he remembers, then he goes back to his normal life. It's funny, though, because the scariest part of the book for me isn't the bits at the end where it looks like the world might end and it's a fight between life and death. No, for me the scariest parts are in the middle. Ursula Monkton is the scariest villain I can really think of. Because she preys on those fears that we all have, fears left over from childhood, that never really leave us. Honestly, this is the basic form of most child abuse, and as a child abuse narrative, this is genuinely terrifying. There's something so rightly horrifying about being vulnerable and afraid while someone hurts you, and knowing that you cannot stop them, because they are bigger and stronger than you, and knowing that you cannot tell anyone, because they are better liked than you, more likely to be believed, and most of all, knowing that it will not end. Makes me uncomfortable just to think about it. 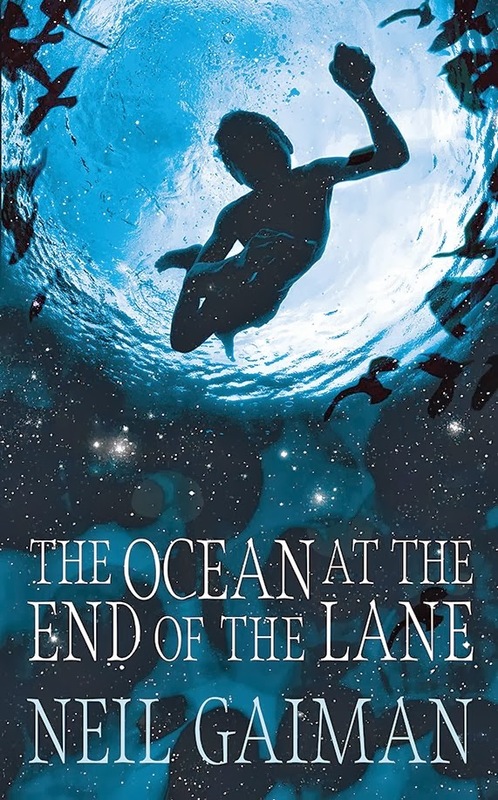 So when I think of The Ocean at the End of the Lane as a metaphorical exploration of repressed memories of child abuse (which the book genuinely contains - the man has completely forgotten about an incident where his father, under Ursula's influence - holds his head under in the bathtub until he passes out), it's a much better book, actually. I know that's strange, but it's true. There's something really interesting about the stories we tell ourselves to feel better about horrifying situations, and this one is a good one. It's about the importance of remembering, but also the importance of forgetting again. And how much difference one kind face can make. The other thing I really love in this book is the Hempstocks themselves. They're clearly witches, even falling into the simple Maiden, Mother, Crone categorizations, but they're fantastically different. While they share a common sense of purpose, and a plainness of speech and behavior, each Hempstock woman is quite different - in temperament, ability, and relationship to the narrator. But none of them are stereotypical. Not at all. They're real people, who happen to be a bit magic and kind of immortal. Well, not really immortal. Timeless, maybe? Scary, definitely. They're just really interesting characters, and perhaps the biggest complaint I have about the book, besides the rainy afternoon in November comments, is that we got to see so little of them. We spent a lot of time with the narrator, which is all well and good, because he is the narrator, but there were a fair number of life details included that were just all right, and the page space might have been better spent giving us a peek around the Hempstock farmhouse. Just saying, I'm dying to look around that place. Overall, though, whatever my complaints about the tiredness of the style or the meh-ness of the ending (it was a bit meh), the book is good and I enjoyed reading it. There aren't that many more things you can demand of a book. It had interesting female characters, a compelling story, a non-annoying child protagonist (impressive), and ended when it needed to. And that's not half bad. Oooh, I love the repressed abuse memory idea. I was also weirdly under the impression that this wasn't fantasy when I started reading it (the synopsis doesn't say anything), and so had a lot of fun being dipped and then thrown headfirst into all the weird stuff. Also, I will never get over the kid pulling the worm out of his foot. I just can't fathom doing that when I was younger, or my brother for that matter. And then it becomes a pun. Oh man, that would be so weird, reading this book without expecting it to be fantasy! And yeah, the worm foot thing was completely horrifying. The worst part for me was that the hole didn't go away. Blech.